“Every man’s a king!” declaimed Marlon Brando memorably as the brutish Stanley Kowalski in the film adaptation of A Streetcar Named Desire – “And I’m the king around here!” He was quoting Huey Long, a Democrat senator and the 40th governor of Louisiana. Long, an ardent populist who believed in the redistribution of wealth, may not have had in mind Kowalski’s unreconstructed opinions when he created the motto “Every Man a King”, nor, I suspect, would he have had in mind the clientele of “Le Manoir aux Quat’Saisons” in Oxfordshire, but this is exactly how I felt a few moments after the taxi landed us on the forecourt of the famous hotel and restaurant. And my wife, naturally, a queen. “Mr and Mrs Chapman I presume?” asked Laura, the well-spoken front of house who met us as our vehicle swung to a standstill. “And this must be Daisy!” She exclaimed as our daughter burst from the bonds of her child seat. A phalanx of staff, suited and booted, smiling benignly but genuinely, hovered at a respectful distance. It felt as if I was returning home to my mythic kingdom after many years away. His and Her Royal Highness of Finsbury Park. Such is the illusion of “Le Manoir”. Every man a king? No, just me. Of course I knew none of this when I arrived, and feeling a little seedy from the journey, I was keen to freshen up before dinner and perhaps collapse on the bed for a few idle moments. The corridor we were led down in the stables, and which our suite was off, was neutrally decorated and I naturally assumed the room would be a continuation of these pastel shades. So when the door to the suite, which discreetly bore the name of “Lemongrass”, was quietly opened, it was with some astonishment that I gazed about me. For this wasn’t your typical country house boudoir, but a set out of Dr No! 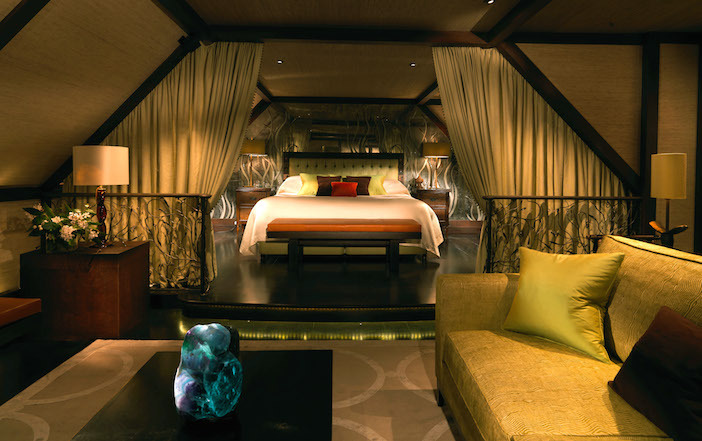 The walls were lime green and clad in bamboo and the bed, situated at the far end, was raised on a dais, like a shrine. And what was as immediately striking as the décor, was the size. It was immense. There were walk-in wardrobes that would have comfortably done for a family of five in Whitechapel, a terrace-sized reception area decked out in low slung couches and a slab-like ethnic coffee table, and in between, an expanse of black wooden flooring that would have had an asthmatic reaching for an inhaler simply to cross. All of this is the brainchild of Raymond Blanc, the French celebrity chef and businessman who came to England in 1972 to work as a waiter (having been fired from a restaurant in his hometown of Besançon for having had the audacity to offer the chef cooking advice) and who, only a few years later, opened his first restaurant “Les Quat’Saisons” in Summertown, Oxford, to instant acclaim. He was one of the first chefs to achieve true celebrity status, making many television appearances and hosting his own shows when many of the current crop were still in short trousers. Interestingly, both Marco Pierre White and Heston Blumenthal are amongst his many protégés (the latter sharing Blanc’s fearless delight in experimentation.) Now an OBE, the French Blanc has now become something of a national institution. 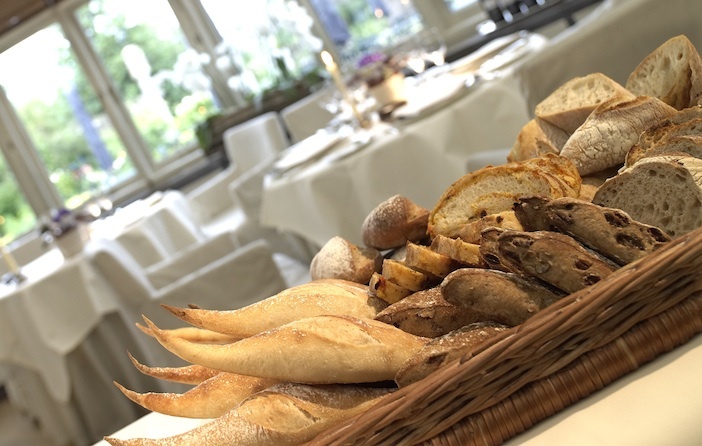 “Le Manoir” is Blanc’s second foray into restauranteering. Arguably, though, it is much more than this. Bought from Lady Cromwell following the death of her husband in 1984, the house has since developed into a hotel, training kitchen for chefs (28 Michelin stars have passed through its portals, including those mentioned above) and a food producing estate which is meticulous in its traditional observances and organic credentials. It now also runs several highly popular cookery courses for the general public of which one, ‘Sauces for Courses’, I was there to partake in. As I was to discover, Blanc has formed a whole philosophy around cooking food and its production, which draws on science and art and which is framed in his vision of the continually evolving estate. After showering in the enormous wet room (transfixed by jets of water coming at me from all angles) I decided to take my daughter Daisy for a stroll in the garden to work off some infant energy before bedtime, and to sate her flexing curiosity (as well as my own). The sun had gone down, the sky was violet and the air was cool. It was very still and only the slightest wisps of sound nibbled at the edges of the picture. Magic hour. Indeed the bronzes we came across – a giant snail, a reading boy, a flock of geese – fascinated us and had the same qualities of the frozen statuary in faraway Narnia. We skirted the line of the ancient brick wall – crumbling and thirty colours of red – and arrived at the huge cedar which spread its arms next to the house. The squares of windows glowed yellow, warm against the gathering gloom, and in the flit of figures beyond, which we could see but not hear, was the sign of bustle of the approaching dinner hour. We cut back across the perfect lawn, past the little ornamental rows of box which reminded me, unsurprisingly, of France. It was time for bed (hers not ours) and the centrepiece of the trip – dinner. Now it must be said that eating at “Le Manoir” is not like ordinary dining. If it is arguably one of the best restaurants in the land, then inarguably, it is one of the most famous. It is fair to say that many wax ecstatic at the mere thought of the experience and, like Mecca, pilgrims come from far and wide to pay obeisance at the temple of gastronomy. Now, I’m not overly religious when it comes to food but I like a good bit of grub as much as the next man. I was curious, to say the least. Built of the same rich ancient brick as the garden wall, the house, formerly known as Great Milton Manor House, I put at seventeenth century. Sitting low and unyielding, it crouches like a leopard. I later discovered that the earliest parts are medieval and that additions were made in the eighteenth century and Edwardian period. What struck me when I first arrived were the profusion of towering chimney stacks and the mullioned windows. The entrance hall is stylishly dark and regal and framed by a large fireplace. There are a couple of reception rooms for relaxing and taking drinks in but the restaurant is predominantly housed in the new extension of a large conservatory. On entering I was struck by how curiously remote and muted this room felt (a sensation which dissipated at breakfast with the sun streaming through the window panes.) Painted white and hung with “decorative art” (modern still lifes etc) the place had the slightly lacklustre feeling of a wedding marquee. It felt less like cutting edge dining, more like doily edged tea taking. Sitting down and stealing glances at my fellow diners I was struck forcibly by something else. 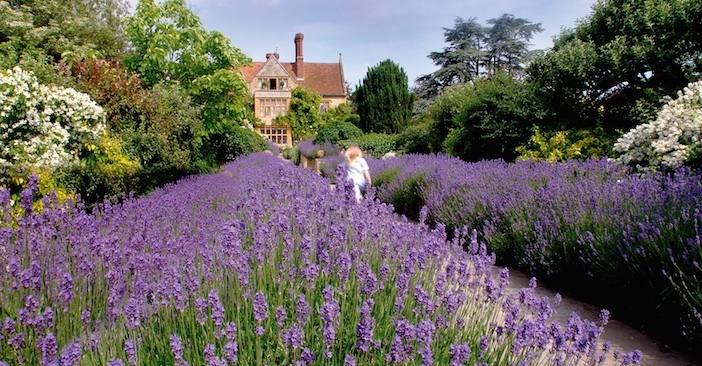 It is perhaps a glib understatement to say that “Le Manoir” is not cheap. With drinks and service included the change from a thousand pounds for a meal for two might feasibly amount to a bag of clinking coppers. The service one receives is undoubtedly on a kingly scale but was one expected to be literally a king in order to book a table? I was expecting several varieties of Eurotrash, a few exiled foreign princes perhaps, a Russian oligarch or two and some home grown glitterati – footballers, pop stars and the like. What I instead found were fairly modest seeming people, dressed for the occasion but unmistakeably ordinary. To our left were a youngish couple that made no pains to disguise their strong Brummie accents. Behind us were a whole family – Mum, Dad and two slightly sullen looking teenagers – who looked straight out of the suburbs of Rickmansworth. 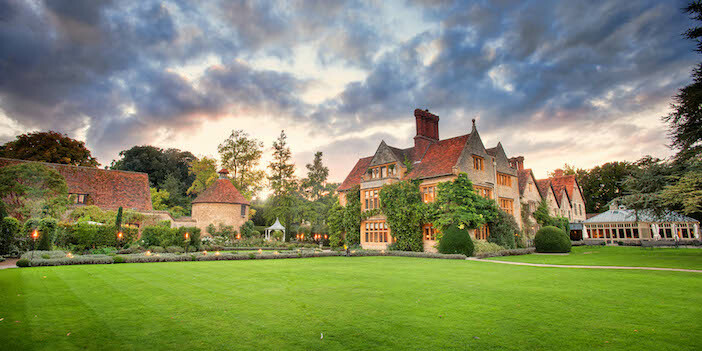 It might take a lifetime to save up for the splurge but “Le Manoir” appeared to be a place which had its doors open to all. 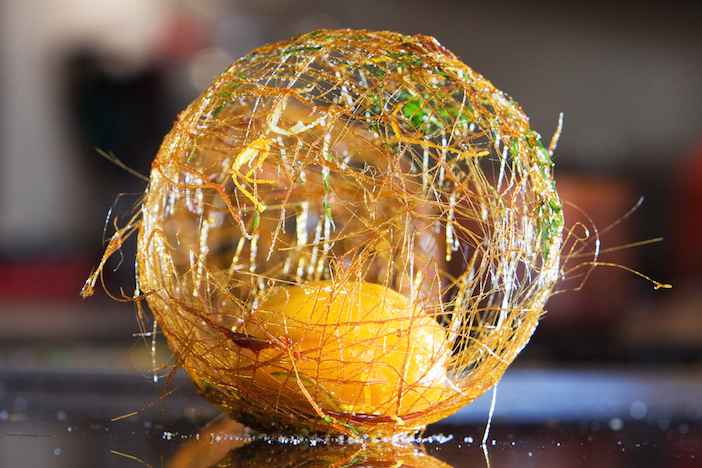 Roughly speaking there are two ways of going with the menu – traditional à la carte or the nine course tasting menu. Now, by inclination I’m a hearty eater. I like my meals big and flavoursome but I also like to see what I’m wrestling with, whether the haunch of some wild beast or root vegetables simmering in their own skins. I like to gnaw and crunch and to emerge slathered in juices. Finger bowls be damned! What I require after finishing is to be hosed down in a pig’s trough. A meal for me resembles rugby match more than it does a gentle game of whist. With this in mind I was erring more towards the standard à la carte (not that even the most basic of Blanc’s cooking could ever be described as peasant’s fare.) That is, until my wife raised her eyebrows at me as though I was mad. Something twigged in me. 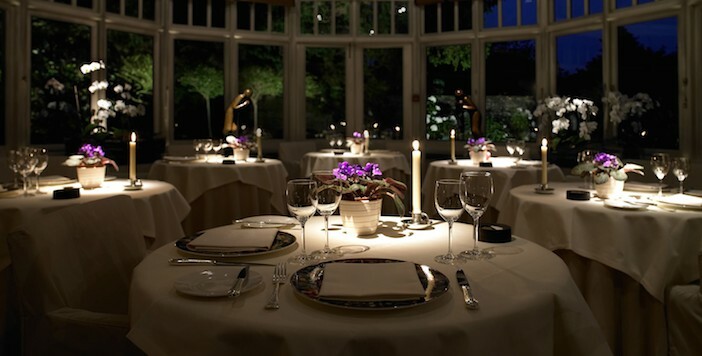 You don’t dine at “Le Manoir” for the volume or the heartiness. You dine for the taste, for the unique combination of flavours delivered by magician hands. I swiftly changed my mind. I went for the nine course taster; there was always the succour of the ever filling bread bowl if I felt undernourished at the end. At the beginning of a nine course tasting menu one waits with the trepidation of a runner on the starting blocks. Indeed in their minuteness and multiplicity the courses constitute a series of sprint finishes. And because of this one doesn’t have the lingering fear of being stranded on a course one doesn’t like for twenty minutes. It has the added advantage, for a culinary ditherer such as myself, that the selection has already been made. The deal is done, so to speak. The menu, naturally, was in French, but fortunately they had the decency to provide an English translation beneath. For those readers, like me, whose French does not stretch elastically beyond the table staples of fromage, du pain and pomme des terres, I include the latter here. To start we had “Ceviche of scallops and oyster, yuzu granite, turnip and radish.” Next came “Confit of Landais duck liver, prune and apple.” Following this was “Ricotta agnolotti, artichoke and tomato vierge.” Swiftly following was “Wild Cornish brill, cockles, lemongrass braisage” and after this “Roasted Pyrenean lamb, spring vegetables, asparagus, garlic and onion purée.” If your eyes smart and your senses reel from this perceived cornucopia, then remember we are only just over half way through. It is hard to single out a single dish as “the best” or even as my favourite because the courses worked very much in complement and harmony. (Having said that, the Pyrenean lamb, perhaps because it was recognisably what it was and steered close to my inclination for heartiness, remains I my mind.) The flavours were nearly all exquisite. Some were so original that they made you pause. But the descriptions themselves provide almost all you need for the tantalising evanescence of the experience. The accompanying wines were also magnificent and appeared with giddying alacrity – reds, whites, dessert wines (all presented with the same understated erudition by the sommeliers as the food was.) I confess to my shame that such was the generosity of wine, that when we got up to leave, the table was dotted, with un-drained glasses. Such was our absorption in the proceedings and our regular pestering of the waiters for more information that we weren’t aware that we were the last diners in the restaurant – by some considerable time. We realised that, despite the rather drab and reverential atmosphere we had encountered on first entering, we had had a good time. 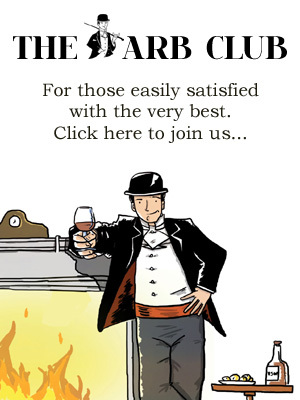 We decided to extend this bubble of good humour by taking a nightcap in the drawing room. Here a fire was burning in the grate and I think we amused the remaining staff by attempting to change the music and dance at the same time. And so to bed. 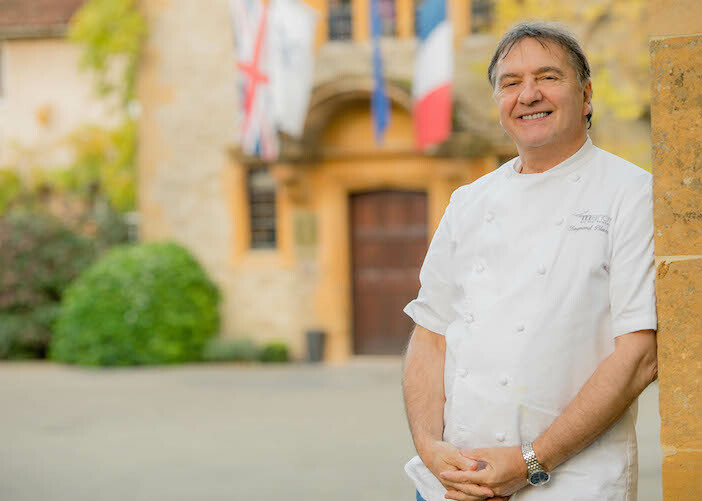 For more information about Le Manoir aux Quat’Saisons, including details of the cookery school, events and offers, visit the website.